SciGuides are a collection of thematically aligned lesson plans, simulations, and web-based resources for teachers to use with their students centered on standards-aligned science concepts. We don’t often stop to think about it, but underlying many of our everyday activities are chemical reactions. From the cooking of an egg to the growth of a child, chemical reactions make things happen. Although many of the reactions that support our lives are quite complex, all follow the same basic rules: matter is conserved; energy is released or absorbed; new substances form. By studying chemical reactions from the simple to the complex, scientists are able to adapt principles of chemical reactivity to developing new foods, medicines, fuels, and even consumer goods such as cleaning agents and fabrics. The investigation of new chemical reactions continues to improve our lives and increase our understanding of the world. This science guide is organized into four sections of Web resources that support curricular activities related to chemical reactions. The first section focuses on atomic rearrangements and changes in electron configurations within reacting atoms and molecules as the basis of chemical reactivity. The second supports the application of these principles to three types of chemical reactions: oxidation-reduction, acid-base, and free radical reactions. The third and fourth sections provide resources for teachers and students to delve into factors governing reaction rates and changes in energy as the result of reaction. 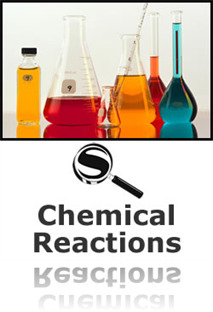 Sites describing everyday examples of chemical reactions (such as those involved in making bread and cheese) are emphasized to help students develop an understanding of the importance and relevance of these reactions to everyday life. Sites are also included that explain some of the newer applications of chemistry, such as its uses in forensic science, medicine, materials science, and engineering. 5 SciGuides are Life Savers! SciGuides are really fantastic. If I am ever asked to teach chemistry, I can be confident knowing I'll have the Chemical Reactions SciGuide to go to for lesson plans, simulations, and web-based resources. I'll be able to create outstanding lessons in a shorter amount of time since many resources are easily accessible in this SciGuide.